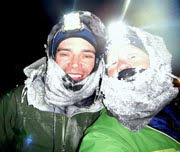 John and I were both in a good mood as we started grinding up the Ashton-Flagg Ranch Road. I was happy to have company for one more day and John seemed excited to be drawing closer to real civilization. I had been promoting Idaho Falls as a good bailout city, but he was set on Jackson. We crossed into the Tetons just as our daily dose of afternoon storm clouds began to settle and darken. John said something about Flagg Ranch and turned on the turbo. Within a minute he was out of sight. John tended to be more of a fair-weather riding partner - which is great. Not a criticism about him at all. If I had the raw strength to sprint away from the rain, I would have used it. John had power. I had good rain gear. Jeremy Noble passed me on the last climb into Flagg, turning slow circles on a big gear. I made a mental note to try and keep up with Jeremy on the hills in the future, which would allow us to ride more together rather than just leap-frog each other. I wasn’t sure if Jeremy even wanted me shadowing him, but I figured we were getting to a time and mileage of the race where any human contact was at a premium. I wasn’t quite ready to face the entire rest of the race alone. John and Jeremy both escaped the storm, for the most part. I descended in a cold downpour amid the splatter of slick mud and crescendoing thunder. For its encore, the storm belched out a blast of pea-sized hail, which pounded my back and stung my scalp through the vents in my helmet. I sloshed into the Flagg Ranch lodge to find John and Jeremy warm and comfy by the fire. I went to the gift shop and bought a snack combination that I was beginning the think of as “rocket fuel:” a chocolate chip cookie/ice cream sandwich and a large coffee. 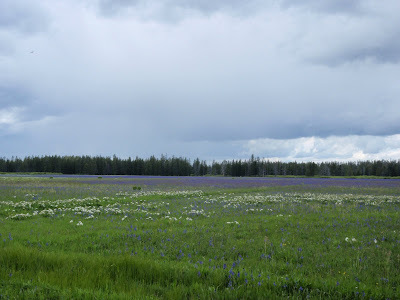 John made a reservation at a lodge near our cut-off junction and we took off down Highway 89. The next morning, John bid me goodbye and I started up Togwotee beneath a bluebird morning. I felt fresh and strong and even pushed my usual pace up the pavement, taking big gulps of cooled oxygen as I drew closer to alpine elevation. Sweeping snowfields wrapped around cathedral-like mountains. Creeks roared in the still air. The cut-off to Brooks Lake greeted me with a deep snow drift that I knew could be covering the road for as many as five miles of unmaintained dirt. The kicker to Brooks Lake is that you can stay on the paved highway and bypass the whole thing. Not only that, the highway is downhill the entire way. I knew this - everyone knows this. In fact, this stretch is probably the most common place for cheating in the race. And, of course, I had no intention of cheating in the race. But even if I hadn’t been racing, even if I had just been touring, I probably still would have taken the snowy road. That’s how excited I was to be up there - the amazingly nice morning, the spectacular surroundings. The snow was fairly packed and probably would have even been rideable if I had hit it up early in the morning, but it was noon and turning mushy. I started walking. I expected this and was even excited about it - snow hiking was a fun diversion from the constant pedaling, and I knew everyone had to deal with it so I didn’t care about the fact that I was going slow. 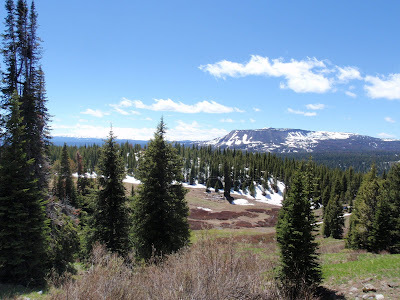 But as I started to lose elevation, the snow fields started to disappear. And what they left behind was mud. The worst kind of mud. The mud that grabs and pulls entire shoes off feet, sticks to every corner of the bike, and forces a hapless smallish cyclist with low clearance on her 29-inch wheels to literally hoist her 50-pound bike as she struggles to free her feet from the sticky goo. And within feet, just like that, I went from on top of the world to mired in frustration and mounting depression. The problem with mud like that is that you just don’t know how long it will last. It could be 20 yards, or it could be several miles. I was still looking at the possibility of several miles. The road was not even passable on foot, and it was cut into a steep mountainside that made it nearly impossible to go around. 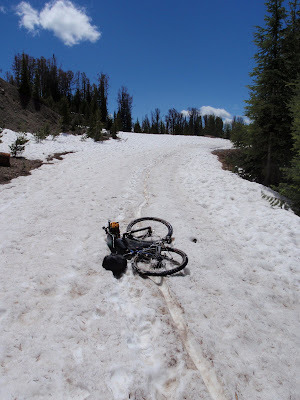 I undid the straps on my frame bag and lifted the bike, gear and all, on my shoulder in order to step down the steep slope and try to pick my way along the rocks. Calling a situation like that sketchy is an understatement. It was so hard to balance with the bike that I slipped a couple of times, rolling my ankle once but luckily doing no further damage. I could have easily tipped over and fallen 6 feet or so. But such was the impossibility of the mud. After a long stretch of time with little ground covered, I would reach another snow drift, which would lift my heart out of the depths and give me hope that the struggle was over. But the snow would end, the mud would begin, and I would continue the slog. After three hours in which I covered less than three miles, I finally made it to the Brooks Lake Lodge, where I was relieved to discover a plowed gravel road that was mostly dry. I coasted back to the pavement, greatly humbled. 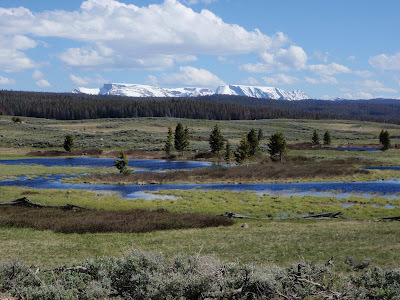 My mood improved again as I pedaled beside the Wind River Mountains. The day was beautiful, despite a strengthening headwind. 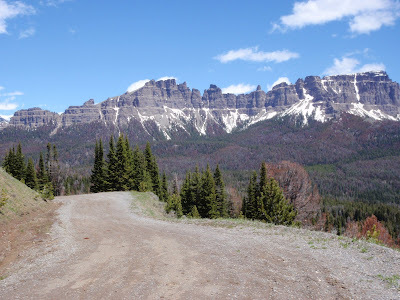 I began the climb up Union Pass on a wide gravel road, munching on Sour Patch Kids and cheese crackers. Although I was somewhat low on food, I opted not to stop at the little store at the highway junction because I was under the impression there was a lodge at the top (this was a case of misunderstanding something John had told me and not bothering to double-check my maps.) 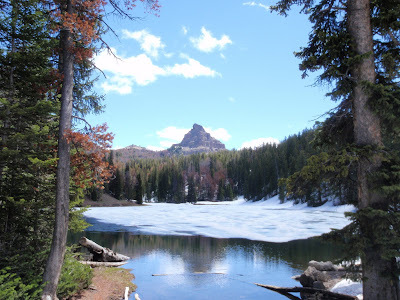 But I started up thinking I was going to find the crowds and commerce of the Tetons. I crested the 9,210-foot pass to a starkly different world. 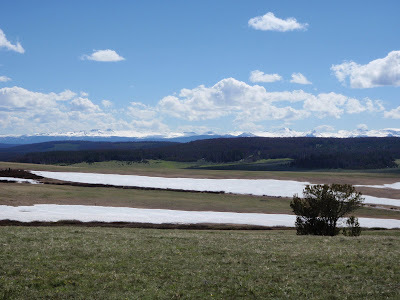 The high alpine plain was streaked with snow and devoid of any human structures. Unhindered by trees or mountainsides, the headwind that I had been fighting all day hit fever pitch. Riding into it, I could hardly make my legs move. Any time the road curved, the crosswind was strong enough to nearly knock me off my bike. It was discouraging, but my capacity for frustration had been so drained by Brooks Lake that I accepted it without complaint, put my head down, and plowed forward. And I began to accept that there was no lodge up there. There was no food. There was nothing but the rolling alpine meadows, the wind, and the fact that I had no choice but to pedal. 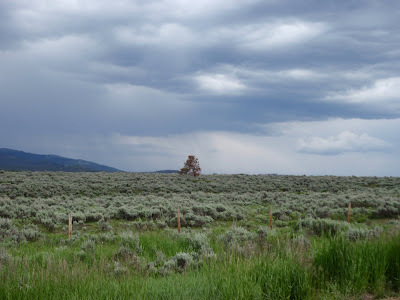 The road to Pinedale was lined with wide-open sagebrush fields. Dark descended long before I made it to town, but I was pretty much running near empty with only a couple of Power Bars in my emergency food rations, so I had to put in the miles. I didn’t mind at that point. I was happy to see such different terrain. It was the first time I could really recognize just how far I had come. I stopped at what looked like the nicest hotel in town pretty much solely because it was next door to a gas station - likely the only food source that was open after 11 p.m. For anyone considering entering this race in the future, this is my biggest piece of advice: Get a good credit card. Pretend that you have a million dollars. Pretend money has no value. Buy yourself exactly what you think you need. Take care of yourself first and worry about your financial situation later. This race is hard enough without trying to do it on a tight budget. 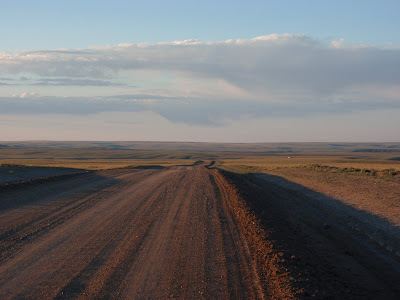 The next morning, rested and well fed, I set out toward the high desert of central Wyoming. My body felt great but my bike was a different story. The mud and miles had taken their toll and it was making weird clanking noises. The brake pads were nearly worn out. Even after adjusting them several times, they still barely caught the rotor unless I throttled them. The cables were gummed up and the shifters weren’t working properly. I couldn’t shift into my small ring unless I stopped and physically moved the chain with my hands. 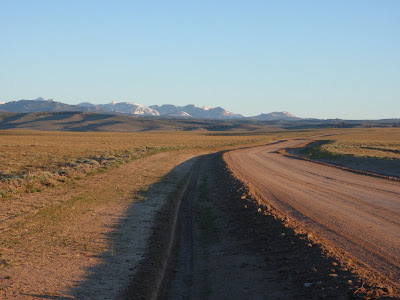 The rough gravel road climbed and dropped steeply over the drainages of the Wind River Range. Because I didn’t have a low gear and was feeling good, I mashed up the steep grades before flying down the next hill. By the time I reached South Pass City, my knees were on fire. 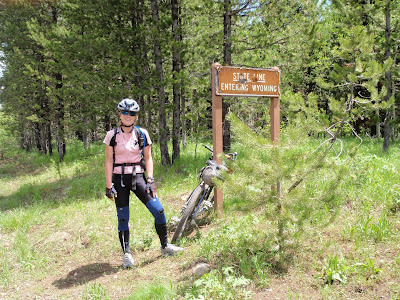 I stopped for a while at a rest stop near a highway crossing, and by the time I tried to ride again, my knees were stiff to the point of sharp pain. The climb into Atlantic City was the steepest of the day, and I had to walk up most of it. A couple in an SUV passed as I was hiking. They honked and waved. Atlantic City is another example of a place where I misunderstood John’s recommendation about it and failed to double-check its services on my map (this would be the last time I would be so nonchalant about preparedness. I ended up finishing the race with more than two days worth of food.) My heart dropped to my knees when I saw the sign that said “Atlantic City, population 57.” I had no idea the town would be so small. It was after 6 p.m. 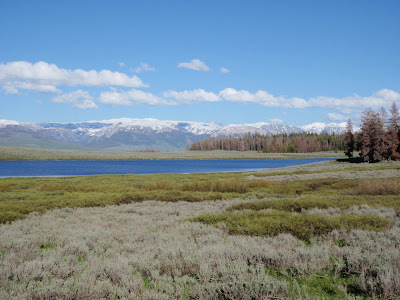 I had been expecting to load up with everything I needed to cross the Great Divide Basin, over 140 miles of no services, before I continued on that night. I’d be lucky to find a cattle tank in this town. I rode by a touristy-looking mercantile with a sign on the door that said, simply, “Closed Tuesdays.” It was Tuesday. But I could see signs of life in a building next door. And when I walked inside, I realized it was a bar. The bar turned out to have a full menu of dinners and a little shelf with provisions. They weren’t good provisions. In fact, everything on that shelf was food that I would never eat in real life, and would probably even spurn on a hungry trail unless I was desperate. But I was desperate. I loaded up with single-serving packets of Spam, expired Oreos and heavily processed pastries that I would later learn had deteriorated beyond the point of stale to near dust. But I was grateful for them. I ordered two Pepsis, fried chicken strips and soup, and sat down, happy. My knees were still throbbing and I debated how far I’d be able to ride that night without significant rest. While I was stewing about my knees and my backpack full of Spam, a couple eating dinner next to the window waved me over. “Were you the biker we saw out of South Pass City?” she asked. “You mean the one walking my bike?” I said. “Yeah, that was me.” She asked me to join them. She said her name was Maryjane, and she and her husband, Terry, were retired and lived in an old gold mill that had been converted to a house. She asked me if I wanted to spend the night at her house. I smiled. 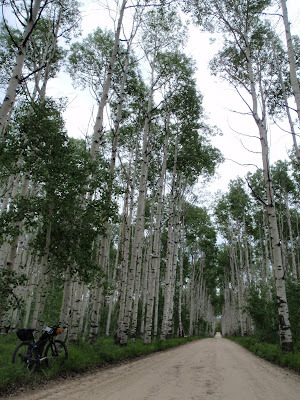 I had been hoping to ride further into the Great Divide Basin, but how could I refuse? As I said earlier, money is worth little on the Great Divide, and even miles can only amount to so much. Kindness is worth everything. The comfy hide-a-bed amid the stone walls of the old mill turned out to be one of my big blessings of the trip. 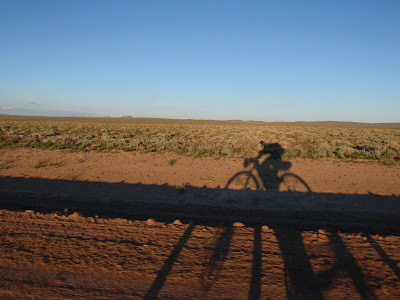 I woke up at 4 a.m. and made myself a huge breakfast and liters of coffee to fuel up for the long, thirsty, Spam-subsidized ride across the Basin. I massaged my knees for a bit but noticed the were feeling significantly better after a long sleep. I wrote a sincerely grateful note to Terry and Maryjane and walked out to find my bike covered in frost. The first hints of sun pierced the salmon-colored sky just as I was passing what my map promised would be the last tree until Rawlins, and I smiled, because I decided that day was going to be a good day. 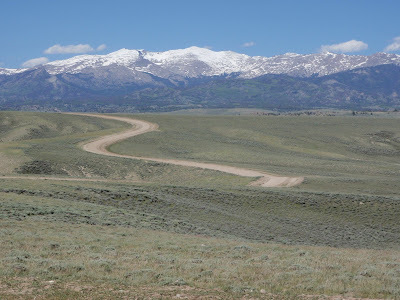 The ride through Great Divide Basin was significant for me because it paralleled both the Pony Express and Oregon Trails. My family has lived in Utah for generations, and I have great-great-etc. grandparents who crossed the plains with the Mormon pioneers. My great-great-etc. grandfather crossed the Rockies with an early company and helped settle the town of Hyrum, Utah. They went through the Great Divide Basin at a time when there was truly nothing out there, and they had little more to go on than faith. I like to think that the adventurous pioneer spirit of my ancestors lives on in me, and I was excited to see the desolate regions they had traversed, to see the desert landscape that had not changed much since the 1850s, and see it in a manner that was not so different than theirs. 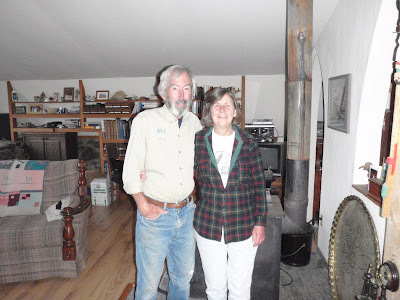 The day before, I had asked Maryjane about Willie’s Handcart, a historical site that the route goes right by. She told me that Willie’s Handcart Company had been bogged down further east because the wheels on their wagons were breaking and they didn’t have the tools to repair them. 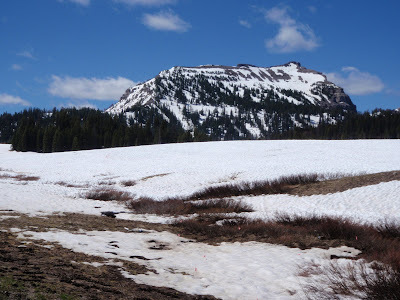 By the time they got their wagon issues sorted out, they lost several oxen and ended up reaching the Great Divide Basin perilously close to winter. The were slammed with an early storm near the crossing of the Sweetwater River, and many people in the company perished. Historical tragedy was fixed in my mind just before my own freewheel started to slip. I was about 30 miles beyond Atlantic City, coasting near the bottom of a long hill when the hub first refused to engage. I spun the pedals wildly as the bike slowed to a near stop. I hopped off, lifted the rear wheel off the ground and turned the crank by hand, frantically willing the wheel to start turning again while imagining my 30-mile walk back to Atlantic City. When it finally engaged, I dropped the wheel and jumped back on the bike quickly. I pumped hard up the next hill and tried to coast again, only to have my freewheel slip on me again. 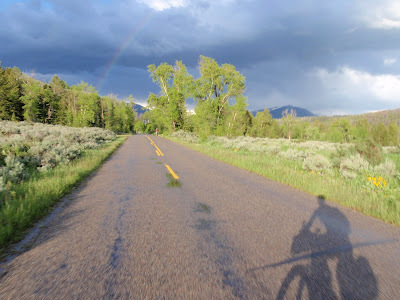 I spun the pedals as quickly as I could, finally creating enough friction to get the freewheel the catch, but I was quickly beginning to realize that coasting or stopping was going to be risky from there on out. I pedaled hard and mulled my options. I thought about the possibility of zip-tying the cassette to the spokes and riding the bike as a fixed gear, but I still had at least 110 miles to ride to Rawlins, and I seriously doubted a repair like that would last the distance without tearing apart the wheel. I thought about turning around right there, because 30 miles of uncertainty was better than 110, but it also meant going backward to a town that had no services to help me. If I continued forward, I had exactly two bailout points where there was a 14 to 20-mile spur to the nearest town off route. I finally decided my best option was to continue forward as long as I could, and only stop near these bailout points. From there, I could try the zip tie thing, or I could simply walk out. This turned out to be more difficult than I thought. I could eat my Spam and disgusting pastries from the bike, but I needed to stop to change over my maps or switch my water. I had to rely on my GPS for directions and ration my fluid. Then there was the issue of emptying my own bladder. On top of all that, I was 12 days into the trip and hadn’t noticed how dependent my legs had become on short breaks. After about 20 miles they ached with the thick fire of lactic acid. I tried standing to relieve them, but mostly they just wanted to stop. And I couldn’t even rest on the downhills - if anything, my legs had to work harder to keep me from coasting (huge props to Deanna on her fixed gear, by the way. I never thought descending could be harder than climbing.) Before my first stop, my water was empty, my bladder was so full I was seeing yellow, my legs were on fire and I had no idea whether GPS was really taking me in the right direction. But seeing that intersection on the horizon made me ecstatically happy. And after a 10-minute break, I spun my loose freewheel until it caught again, which made me even happier. I repeated the process to the Jeffery City cutoff, where I had to make the final decision whether to bail or continue toward Rawlins. It was at least 60 more miles to town, and I would be fully committed to making it there knowing I would see little to no traffic for several dozen miles. I pressed forward, repeating my mantra of no coast, no stop, and letting the stress of becoming stranded and the burn in my muscles take my mind off my now only slightly achy knees. 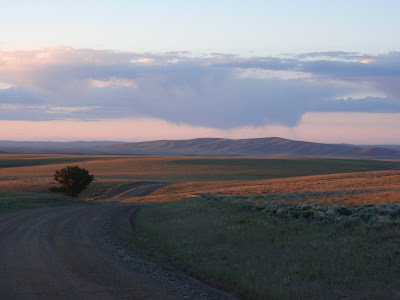 The sagebrush-dotted landscape rolled out behind me, baked in afternoon sun and starkly beautiful in its desolation, and I unfortunately thought little about appreciating it. I just wanted to get to Rawlins - Mecca to me, funny as it is now to think of that grim little Interstate town in that way. I just pedaled and pedaled as if my life depended on it, which, in my mind, it did. From there, the trip to Rawlins went by really fast. I made it to town just after 5 p.m. - 140 miles in 12 hours, one of my fastest average speeds of the entire trip. I was able to squeeze into the bike shop before they closed. The owner said she didn’t think she had the parts to help me - disc brake pads, a freewheel, a new hub, or even a new 29” wheel of any sort. She said her mechanic would be in the shop at 10 a.m. the next day and he could possibly help me. I hemmed and hawed and called around for advice. I didn’t want another day of freewheel-induced stress, and I certainly didn’t want to become stranded, but I also didn’t want to burn up as many as 18 perfectly good hours sitting around Rawlins for a solution that may not even be a solution. But I finally decided to wait. 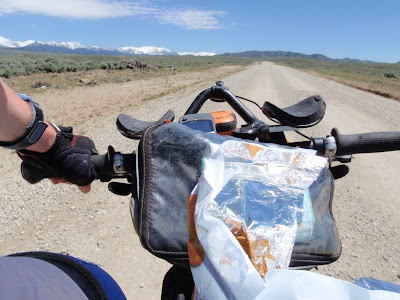 I knew I would never forgive myself if I really did become stranded on the Colorado border and quit the race because I was too impatient to wait for a bike mechanic. I told myself the rest would do me some good and lots of fresh grocery store food would help my system flush out the Spam and dust pastries. The next morning, 10 a.m. came and went. The bike shop owner let me in the back of the shop, where I deep-cleaned my drive train and cables and went to work on the front brake. The caliper had been sticking and I had pretty much stopped using my brake because one side of the pads had worn to metal. No matter what I tried, I couldn’t get the new brake pads - my only spare set - inside. Finally, near 11 a.m., the bike mechanic showed up. He turned out to be an 18-year-old kid with sleep still crusted to his eyes. He fiddled around with my brake caliper and admitted he rarely dealt with disc brakes. We worked on it together until he finally just announced he was going to break a piece off one of the arms. I clenched my teeth as he snapped a piece of metal clean off and jammed the brake pads in. After that, they seemed to catch. It seemed sketchy, but I hadn’t had front brakes before, either, so anything would be an improvement. Next he went to work on the freewheel - sure enough, no parts. He said he could take apart the hub, clean and grease it up in about 25 minutes. I went to Subway, stuffed a chicken sandwich through my stress and prayed. By noon I had a mostly complete if still unreliable bike, bags stuffed to the brim with food and a burning desire to get out of Rawlins. Not a fan of hail. Thank you so much for all your great pictures and stories! Awesome post! You are one good writer. Ms. Homer, I've enjoyed your writings for the last several months. Thanks for sharing your stories and good luck on your return home. You're right that was a long post, but what great, no fantastic writing with beautiful photos to go along with it. Mon mot - époussette des pâtisseries! Fantastic story and very well written. I liked the idea of zip tying the freewheel to the spokes as it would work in an emergency....... and I'd say you were close to an emergency at times. But what an adventure. Have really enjoyed your blog and will watch to see what else you are up to as you are a good writer. I'm jealous of your epic adventures. Good luck back in Juneau. Nice tribute to Fat Cyclist at the beginning in your picture. His story turned tragic a few days ago. 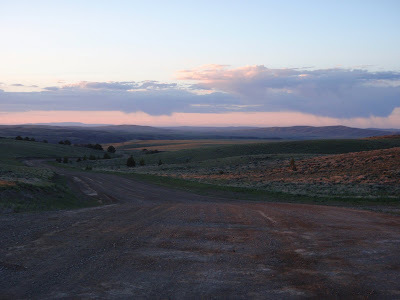 Those pictures make me homesick for Wyoming. Simply beautiful. You have reminded me that I need to get out of the city and go home for a visit.